Are you a freelancer that creates written content? If you haven’t tried guest posting, you’re missing out! 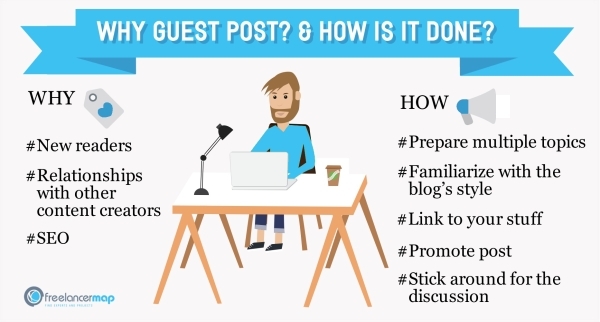 Guest posting can be a gateway to new worlds, leading to a lot of new opportunities and giving you massive surges of attention if you do it right. As part of my work at freelancermap, I’ve had some experience with guest posts and wanted to share what I’ve learned. This article covers the main ways in which guest posts can be helpful and offers my personal insight into how it’s done best. New readers are the main thing everyone who creates written content is after. Posting on someone else’s blog opens a door to their community. And with how vast the internet is, chances are, a lot of people from that community haven’t heard of you before. When they see a quality piece of content on their favorite blog, there’s a pretty good possibility that they’ll check your other work out. Negotiating a guest post and doing a good job of it is one of the best ways to expand your network. You get in touch with people who are interested in the same things, are willing to offer you exposure and benefit from the quality of your work. Those relationships tend to be quite strong and can lead to future opportunities for both sides. Last, but not least, having links of your content on another site and vice versa is one of the oldest and best ways to bump up your position in search engines. Google loves backlinks, but post length and additional links are things you should also pay attention to. To land that guest post, it is a good idea to be flexible with the topics you can write about. If the particular blog you’ve chosen has already covered the subject in the last couple of weeks, they’re unlikely to bite. Some sites have specific rules for guest posting, others tend to go for niche content or have a specific writing style. That doesn’t mean you should copy the way they write content, but paying attention to their target audience and goals is essential if you want your post to be approved. This might as well be rule one, the only reason it’s not up there is because it’s so obvious. You absolutely have to make sure to be identified as the content creator. Add a link to your own online presence, allowing potential readers to find you without having to type up your name in Google. Treat the content you guest post as you would your own. Market it on your various social media profiles and mention it in future pieces. If the site you guest post on does the same, that double effort will increase exposure a good deal beyond the usual. Finally, don’t just guest post and leave. Make sure you engage with the content you’ve created – if people are interested in your post they might have some questions. Joining the discussion is both productive and fun. Have you guest posted or are you considering it? Would you like to be guest blogger at freelancermap.com? We hope our article helped and would love to answer any questions that you might have in the comments below. Thank you for the great tips, I have written a guest post on freelancermap, and I must say that I read all your articles here before I submitted a topic. You know your stuff, true that. thanks so much for the compliment. Writing is just like any other skill - the more you do it, the better you get. So keep on keeping on! Very valuable and informatiove article for the newbie freelancers. Thanks for stopping by Shafeek! We are glad you found the article useful!